Patent ductus arteriosus (PDA) is a type of congenital heart defect. Congenital heart defects are heart problems a baby is born with. These heart problems are usually diagnosed at or before birth. The heart has two major blood vessels attached to it: the aorta and the pulmonary artery. The aorta carries oxygen-rich blood (red blood) from the heart to the rest of the body. The pulmonary artery carries low-oxygen blood (blue blood) from the heart to the lungs to pick up oxygen. Before birth, your baby (fetus) lives in amniotic fluid. So your baby doesn't breathe through the lungs. 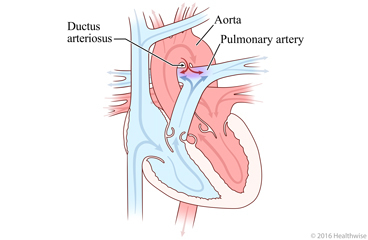 Instead, the ductus arteriosus helps the baby's body get red blood from the mother. Normally this opening closes shortly after birth because the baby doesn't need it anymore. If the opening stays open, some of the red blood in the aorta flows back into the pulmonary artery and to the lungs instead of to the rest of the body. Because some of the red blood that was supposed to go to the body is going to the lungs, the heart has to pump harder to get red blood to the body. This can make the heart bigger and make it harder for the heart to pump blood. Your baby may need special care, such as being in the neonatal intensive care unit (NICU). This may be scary for you. The hospital staff understands this. They will explain what happens and will answer your questions. Your doctor may hear abnormal heart sounds, such as a heart murmur, when he or she examines your newborn. Your doctor will order tests to find the cause of abnormal sounds or of symptoms. The most common test used to identify this defect is called an echocardiogram, or "echo" for short. It uses sound waves to make an image of your baby's heart. Your baby may have other tests, such as an ECG or EKG (electrocardiogram), chest X-ray, and checking the amount of oxygen in the blood. Symptoms depend on how big the opening is. Babies with smaller openings may not have symptoms. A blue tint to the skin, lips, and fingernails. Being fussy a lot of the time. Your doctor will help you understand your baby's condition, your treatment choices, and what to expect from each choice. Medicine. Sometimes medicine can cause the PDA to close. Surgery. Your doctor may use open-heart surgery to close the PDA. Your baby will be asleep during surgery. Catheterization. The doctor puts a thin tube into a blood vessel in your baby's groin. This tube is called a catheter. The doctor moves the catheter through the blood vessel to the heart. The doctor feeds tools through the catheter to plug the opening. Your baby will be asleep during this procedure. You may see tubes and wires attached to your baby. This can look scary. But these things help the staff take care of your baby. The tubes may supply oxygen, fluid, or medicine to your baby. The wires are attached to machines that keep track of your baby's pulse rate and other vital signs. It may seem that your baby is getting lots of tests. All of these tests help the doctor keep track of your baby's condition and give the best treatment possible. It's hard to be apart from your baby, especially when you worry about his or her condition. Know that the hospital staff is well prepared to care for babies with PDA. They will do everything they can to help. If you need it, ask for support from friends and family. You can also ask the hospital staff about counselling and support. Enter E290 in the search box to learn more about "Learning About Severe Patent Ductus Arteriosus in Newborns".